Engineers utilize their imagination and sharp analytical skills to conceive, plan, design, build, and manufacture all important components to public society. Since engineering is so varied, the salaries provided to these engineers depend highly on the type of occupation in the field, their expertise, and reliability. Read on to learn more about the some of the more common subfields in engineering and their average wages gathered from the U.S. Bureau of Labor and Statistics. Aerospace engineers are responsible for coordinating the design, manufacture, and testing of spacecrafts, airplanes, satellites, missiles, and other aerospace products. Aerospace engineers typically are employed primarily in aerospace product manufacturing, engineering research, control instruments manufacturing, and federal system of national defense. Employment for these engineers is expected to decrease faster than average at a rate of 2 percent until 2024. According to the Bureau of Labor Statistics May 2015 records, the mean annual aerospace engineer salary is $107,830. In other words, the 72,500 engineers employed in this field earned an average hourly wage of $51.84. The bottom ten percent earns $67,850, while the top ten percent of aerospace engineers earns an outstanding average annual salary of $158,700 – an increase over the last few years. Electrical engineers are responsible for designing, developing, testing, and manufacturing various types of electrical equipment, including motors, radar systems, and power generators. Electrical engineers hold around 160,560 jobs nationwide in engineering services, electromedical manufacturing, electric power generation, and the federal government. Electrical engineering employment is expected to grow at a slower than normal rate of 6 percent between 2010 and 2020, although experts are hopeful that technological innovative will increase demand. The Bureau of Labor Statistics indicates that the mean annual electrical engineer salary is $91,810, or $44.14 per hour. The lowest ten percentile earns an average of $56,490, while the top ten percent make $136,690 annually. Electrical engineers can find the highest paying jobs in computer systems design, with an average salary of $102,860. Within one of the broadest engineering disciplines, mechanical engineers perform research, design, develop, and test various machines or tools. The work of the mechanical engineer revolves around people and their daily routine, from vehicles to elevators and refrigerators. Mechanical engineers work in engineering services, research/development, manufacturing industries, and the federal government. There are an estimated 277,500 jobs in mechanical engineering and employment is expected to grow at the average rate of 5 percent until 2024. As of May 2015, the average annual mechanical engineer salary is $83,590, which translates to a mean hourly wage of $40.19. Percentile wage estimates suggest that the lowest ten percent earns $53,640, while the top ten percent receives an average salary of $121,530. Mechanical engineers that are employed within the oil and gas extraction industry earn the most, with a tremendous six-figure salary of $128,430. 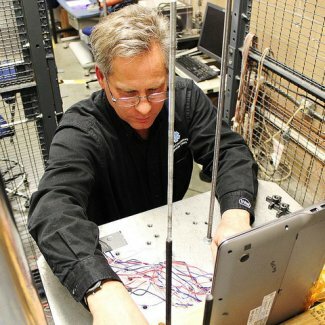 Computer hardware engineers are responsible for researching, designing, and developing hardware like processors, circuit boards, external or internal memory devices, and networking infrastructure. 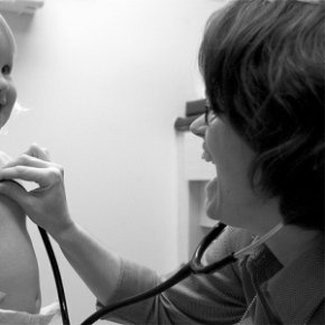 They usually work in sterile high-tech laboratories, research facilities, or manufacturing facilities. Their aim is to discover new hardware principles and manufacturing techniques to further advance technology. Until 2024, employment in computer hardware engineering is expected to grow slower than average, at a rate of only 3 percent. According to the Bureau of Labor Statistics May 2015 records, the mean annual computer hardware engineer salary is $111,730. The 77,700 engineers employed in this field earned an average hourly wage of $53,72. The bottom ten percent earns $65,570, while the top ten percent of computer hardware engineers earn an outstanding average annual salary of $167,700. Software engineers are the brains behind custom computer programs and applications for individual clients, Engineering software involves abundant knowledge on how computers and programming work, concentration, and creativity. Software engineers usually work in office settings. The field is expected to grow much faster than average by 2024, at a 17 percent rate, mainly because of demand’s substantial increase. According to the Bureau of Labor Statistics May 2015 records, the mean annual computer software engineer salary is $100,690. In other words, the staggering number of 1,114,000 engineers employed in this field earned an average hourly wage of $48.41. The bottom ten percent earns $57,340, while the top ten percent of computer software engineers earn an annual salary of $159,850. Chemical engineers are problem-solvers that improve production of fuel, drugs, or other chemical products by applying chemistry, biology, physics, and math principles and introducing them to the automated production process. Therefore, a chemical engineer will devote a significant part of his or her time to design equipment, processes, or practices. If no unforeseeable changes occur, chemical engineering will slowly grow with 2 percent by 2024. According to the Bureau of Labor Statistics May 2015 records, the mean annual chemical engineer salary is $97,360. As a consequence, the 34,300 engineers employed in this field earned $46.81 for every hour they worked. The bottom ten percent earns $59,470, while the top ten percent of chemical engineers earn an average of $157,160 every year. A materials engineer is in charge of developing, testing, and surveilling the manufacturing process of a vast range of products, from everyday items to medical or aircraft equipment. Extensive knowledge of the atomic structure and behavior of materials is needed to improve their performance and develop new ones. Materials engineering is one of the few fields that show steadiness, with no significant changes until 2024. According to the Bureau of Labor Statistics May 2015 records, the median annual materials engineer salary is $91,310. This means the 25,300 American engineers employed in this field earned an average hourly wage of $43.90. The bottom ten percent earns as low as $53,120, while the top ten percent of materials engineers earn as much as $144,720 every year. How Much Do Mechanical Engineers Make? + Infographic How Much Do Computer Engineers Make? 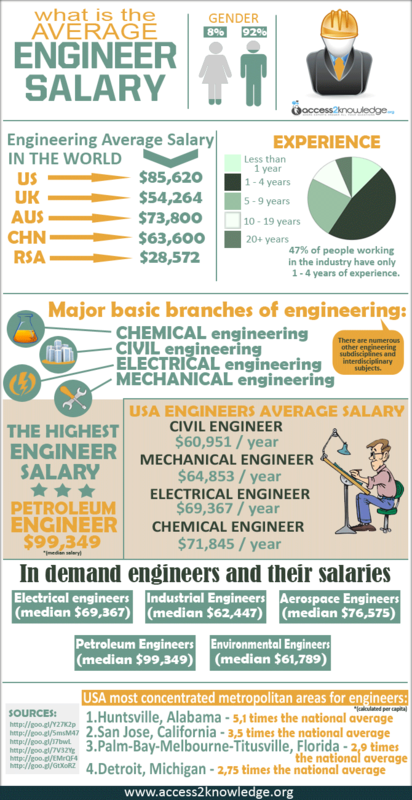 How Much Do Chemical Engineers Make? What Does An Aerospace Engineers Do? How Much Do Electrical Engineers Make? What Does A Computer Engineer Do? How Much Do Civil Engineers Make in 2018? That’s an awesome profession to aspire to! I wish you luck!